Hi buddies. 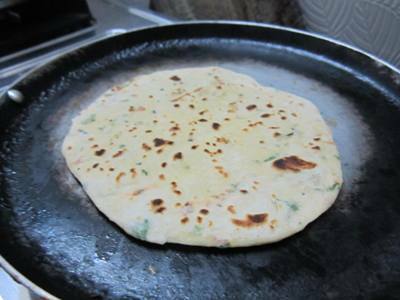 Are you bored of eating the same simple rotis or chapatis? 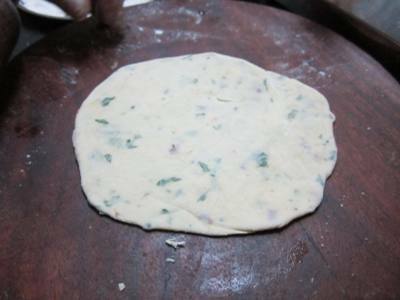 Then today I am sharing the recipe of very flavorful, yet light rotis. 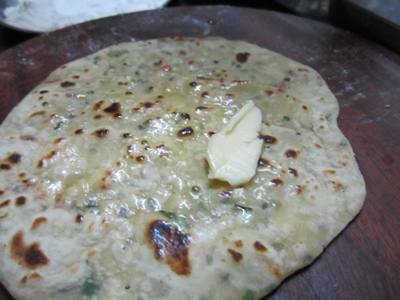 These rotis are made from maida/all-purpose flour and wheat flour and have a very nice fragrance of garlic and dried red chilies. When you don’t want simple rotis and neither the overly heavy parathas, these rotis come to your rescue. Since the chili-garlic roti is mildly flavored, it pairs up nicely with spicy curries. 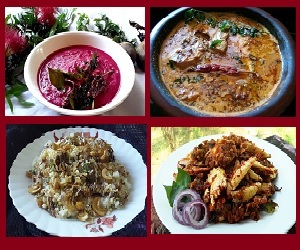 I served these yesterday with the Chicken Korma. 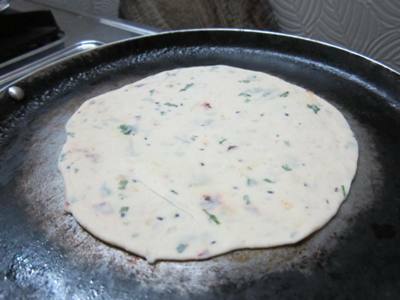 Let’s get started with the easy recipe these delicious rotis. For the purpose of measurement, 1 cup = 250 ml. 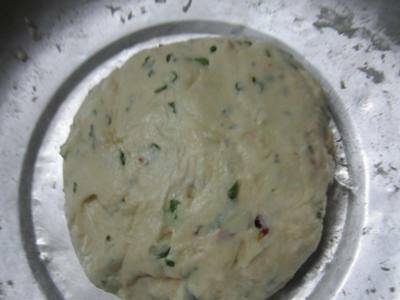 This recipe yields 5 large rotis or around 7 medium sized rotis. I made the medium ones. 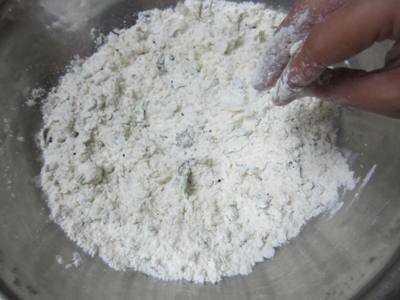 Sift the maida/AFP and wheat flour in a bowl. Add all the other ingredients to it except the water. 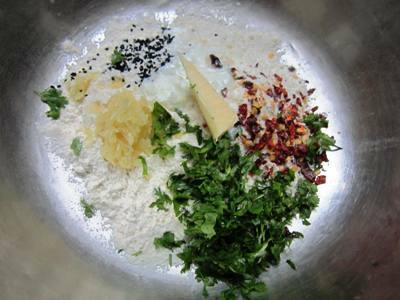 Mix everythign well till till looks crumbly. Knead a soft pliable dough using water as needed. Make a ball and apply some oil or butter over it. Cover the dough with a damp cloth and let it stand for 10 minutes. After 10 minutes, give the dough a final knead. Divide it in 7 parts. Take a portion, make a ball and dust a bit of dry maida/APF to ensure that when you roll out the dough, it won’t stick to the rolling surface or the rolling pin. Roll it to a small circle of say 4 inches. Smear some melted butter t oil and fold the disc into quarters. Roll it out again to a 6 to 7 inches circle. Heat the griddle/tawa well. Place the roti on the hot tawa. Roast the rotis on medium to low heat, till it gets cooked well. It should have golden brown spots like in the picture. Apply some butter while toasting if you want. That will make the rotis very flaky and well done. Or smear it with some butter after it’s done. 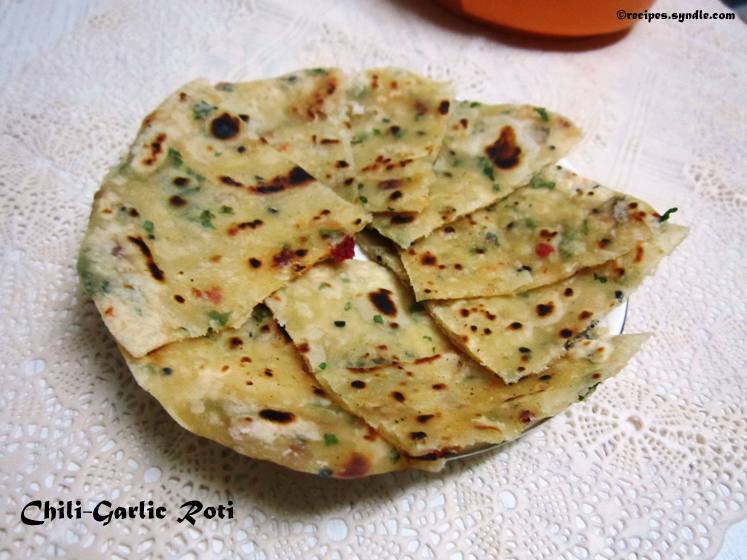 Serve the chili-garlic rotis hot with your favoite curries. I served it with Chicken Korma yesterday.